Bacon wrapped dates & goat cheese! Sweet dates stuffed with goat cheese and almonds, then wrapped in Bacon and rolled in brown sugar. They’re sweet, savory, and the perfect appetizer to bring to your Holiday party!! 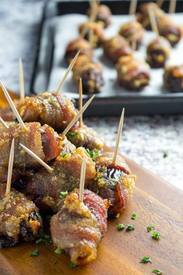 Bacon Wrapped Dates & Goat Cheese are sweet, salty, and wrapped in everybody’s favorite food, bacon. They’re also really simple to make, but look like they took hours to make. If you’re looking for something that looks fancy, takes minimal effort, and tastes like heaven on earth, you’re going to love this recipe from Dishing Delish.